Just as a reminder, we are holding a Twitter event on Wednesday 11th July, 2pm-5pm BST/ 9am-12pm EST. This will be a chance to speak directly with Harlequin editors from across all the romance series we publish around the world, and to pitch us your story ideas! All you need to do is include the hashtag #RomanceIncludesYou in your tweets to join in the conversation. Harlequin/Mills & Boon is the home of romance, and no matter your background or community, we want to read your love stories! If you’re a writer from a community you feel is under-represented when you browse the bookshelves for romance, and think you could write for us, we want to hear from you. You’ll be welcome to pitch us your ideas using the hashtag! 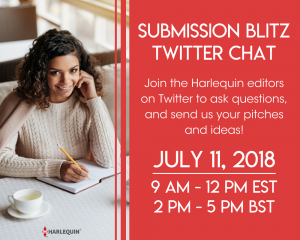 If a story idea you pitch grabs us by the heartstrings, we’ll ask you to submit a synopsis and first chapter (via harlequin.submittable.com) by 2nd September, and we promise to give feedback by 1st October. But fear not, if you don’t have a pitch together by 11th July, you will still be able to submit your story to us to be considered. To decide which of our fabulous series to write for, click here to download free books from all the romance series we publish. Can anyone pitch for this opportunity, or is it strictly for underrepresented voices? And what exactly does it mean for underrepresented voices?